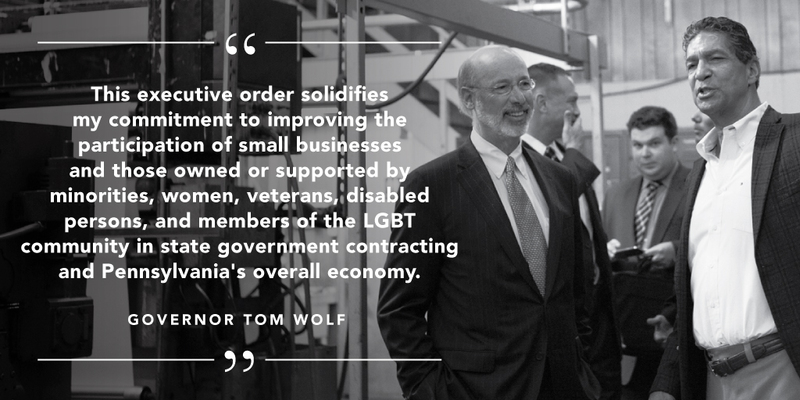 Lancaster, PA – Governor Tom Wolf today signed an executive order solidifying his administration’s commitment to improving the participation of small and diverse businesses – minority-, women-, LGBT-, veteran- and disabled-owned business ­– in state government contracting and the commonwealth’s overall economy. Executive Order 2015-11 (“Diversity, Inclusion, and Small Business Opportunities in State Contracting and Pennsylvania’s Economy”) directs a consistent and coordinated effort to ensure diversity and inclusion in all contracting opportunities for small and diverse businesses throughout agencies under the governor’s jurisdiction and promotes the creation of programs to better prepare those businesses to compete and succeed in Pennsylvania’s economy. Recognizes that we need a more coordinated, transparent and sustained effort across state agencies and a specific focus on capacity building – growing small diverse business participation in the Pennsylvania economy, beyond just state contracting. The Advisory Council on Diversity, Inclusion and Small Business Opportunities council will advise the Governor’s office on state contracting and grant opportunities; job creation initiatives, financing and bonding programs, business assistance and professional development programs. The council’s membership will include key agencies: the departments of General Services, Community & Economic Development, Transportation and Labor & Industry. Small-, minority- women-, LGBT-, veteran- and significantly disabled veteran-business owners, commonwealth agency staff and other key stakeholders will be on the council as well. The Governor announced the members of the council and that the first meeting would take place September 24 in Harrisburg.